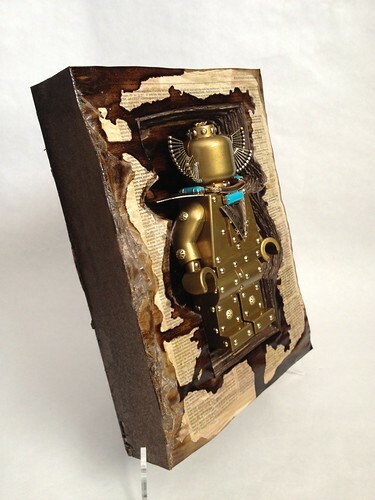 To all you steampunk enthusiasts, you should check out DeeTen’s custom toys. He’s an up-and-coming LA-based artist who’s been customizing for a few years and making quite a splash in the designer toy scene because of his skill and imagination. He is influenced most by steampunk, art deco, antiques, machinery, movie replicas and drag queens. 1AM Gallery is currently featuring one of his pieces, Cursed Idol, in our current LEGO-inspired show, Designing Outside the Lines. Check out his website to see some of his crazy custom toys. Come check out his work in person! Designing Outside The Lines will be running from April 26th until May 25th. For more information, email maya@1AMSF.com.